Tripp Lite's U224-1R4-R is a kit that includes a 3-port USB 2.0 local transmitter unit, and a 1-Port USB 1.1 remote receiver unit. 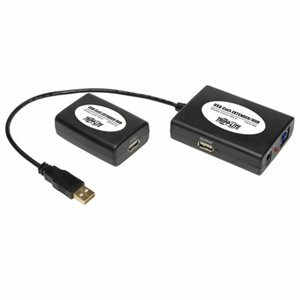 Connect up to 3 USB 2.0 devices to the local trasnmitter, while extending an additional USB 1.1 peripheral up to 45.72 m (150-ft.) from your computer. Simply plug the transmitter into the USB port on your computer, connect your USB peripherals, and run Cat5e/Cat6 cable up to 45.72 m (150-ft.) to the remote receiver unit and connected device. Plug-and-play; no software or drivers required. Get the most out of your USB peripherals with Tripp Lite's U224-1R4-R USB over Cat5 Extender Hub. The U224-1R4-R allows you to connect a USB peripheral up to 150 ft. away from your computer, perfect for home or office workstations with permanently installed or difficult-to-move USB peripherals. The local unit also includes three USB 2.0 ports for newer, high-speed devices. The U224-1R4-R remote unit utilizes USB 1.1 technology and readily available Cat5e/6 cables like the Tripp Lite N202-series. With a compact, durable design and no external AC power supply required, the U224-1R4-R fits almost anywhere in your workspace. Transfer rates up to 12Mbps ensure that your remote peripheral performance will not suffer at any distance. The U224-1R4-R features a green, RoHS-compliant design. With the ability to connect a USB peripheral up to 150 ft. away to your computer and three local USB 2.0 ports, the U224-1R4-R turns your PC into a powerful, multi-faceted workstation. The U224-1R4-R is ideal for home or office applications with permanently installed or hard-to-move USB peripherals in an area that is inconvenient for workstation placement. By extending the range in which a peripheral can be connected to a computer via USB beyond the normal 16-ft. distance limitation, the U224-1R4-R allows for unsurpassed workstation flexibility. Peripherals can now be located in a different area or completely different room from the workstation with which they interact over USB. And, with transfer rates up to 12Mbps, performance never suffers. The local unit doubles as a three-port USB 2.0 hub. With no drivers or software to download or install, the U224-1R4-R is completely plug-and-play right out of the box. Simply connect the local unit to your computer, USB 2.0 devices into the local unit, the remote unit to the USB peripheral via a device cable and connect the units with a standard Cat5e/6 cable like the Tripp Lite N202-series. Your peripherals will have immediate communication with your PC. The U224-1R4-R's compact design allows to it to be located almost anywhere in your workstation. With a built-in flexible cord, the local unit allows for versatile placement around your computer. The unit's ports are housed in a durable casing and the built-in LEDs allow for complete status assessment at a glance. The U224-1R4-R is manufactured in compliance with strict RoHS specifications, reflecting Tripp Lite’s commitment to environmental responsibility. For peace of mind, it comes backed by a three-year warranty.